Situated between two landscape extremes—sprawling office park developments to the south and, to the north, a freshwater wetland and levy-top trails—the Bayfront Office Park establishes a gradual transition from urban to natural environments. 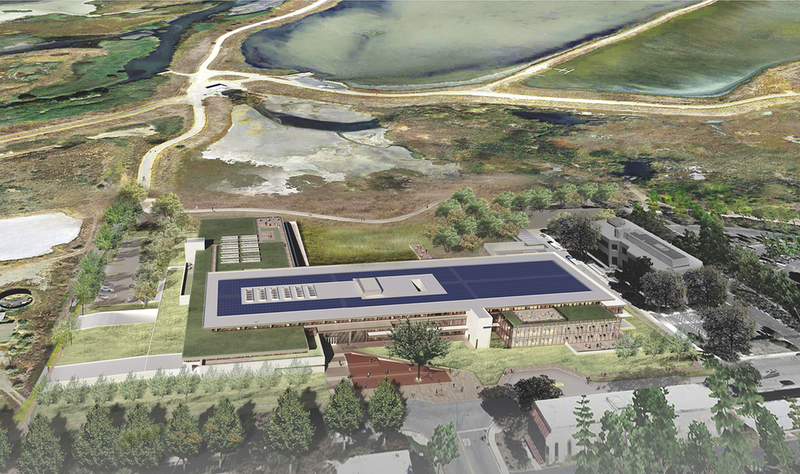 The ten-acre campus, which offers 190,000 SF of office space at the edge of the South Bay Salt Ponds, seeks to exemplify a new type of urbanism where private workplace, public accommodation and the natural environment coalesce in a way that is beneficial to all. The proposed campus expands both habitat and natural resource opportunities to improve the experiential quality of the landscape for the general public and proposed tenants alike. Careful consideration of workplace amenities is coupled with the site’s immersion in its bay-edge context to provide a spectacular office setting. Community benefits include the expansion and improvement of an adjacent Bay Trail trailhead and trail segment. An integrated landscape systems approach to the site's design is evident in topographic modulation, the creation of habitat planting zones well-suited for the regional context, and interrelated stormwater and greywater treatment systems. The site will include seven acres of planted area­—of which 0.8 acres is on-structure—consisting of six distinct landscape typologies, each providing diverse habitat resources for native ecologies and offering unique aesthetic qualities. The result is a campus that is at once beautiful and highly performative.